Learn how to build an overnight bushcraft camp with this DIY survival tutorial. In today’s video, you’ll learn how to build a bushcraft shelter from scratch. But first, let’s talk a little bit about what bushcraft is. At its core, bushcraft is about being one with nature. Man has always used natural resources to his advantage; however, it’s important not to take it too far. This can be a difficult line to toe, but it’s very important that we, as survivalists and outdoorsmen, have respect for nature and do our best to leave it at least as good as we found it. Bushcraft itself can be quite simply explained as the skills needed to enable you to survive, live, and thrive in a wilderness environment. Generally, without any modern amenities, these skills can only be gained through knowledge and real-life wilderness experience. 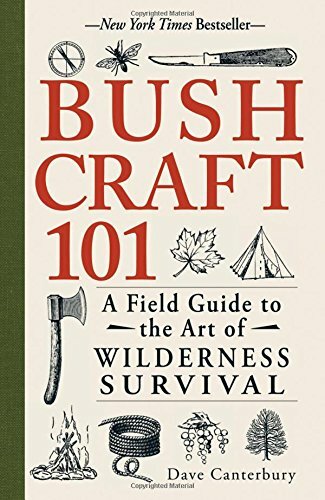 Here we will teach you more about what bushcraft is, plus some tips and techniques on how to build an overnight bushcraft camp! Build an Overnight Bushcraft Camp and Survive the Night! Location is everything when building a bushcraft camp for your comfort and safety. The ideal location will have to be even and flat, and far from possible hazards like falling rocks and dead trees. Avoid loose ground ledges and set up camp as far from the water’s edge as possible to avoid flooding hazards. An area with a good vantage point will also be ideal, and a morning shade, a bonus. If you’ve been camping for a long time, you are probably familiar with the prevailing wind of the area. This wind rose resources from the National Oceanic and Atmospheric Administration will also help. The idea is to build your overnight bushcraft camp shelter opposite of the prevailing wind. Based on experience, this helps prevent rain from blowing in your shelter and for ventilation. But, this is also situational and you may choose to be weird about this and have it your way. I like my camp entrance facing the rising sun so I can wake up to it. After all, your own experience will be your best teacher. Now that you’ve decided where to set up camp, collect materials in the area. Collect anything with potential use around camp for your shelter, a fire shelter, and for starting a fire. Fallen trees, debris, leaves, twigs, and barks are valuable bushcraft camp materials. You might want to employ your botany 101 to avoid poisonous plants like poison ivy. Check out this: 10 Critical Points You Need To Know About Building Any Natural Shelter! A basic know-how of the essential knots is given in survivalists. It will do for building a bushcraft camp but you also have to consider the type of knot used when building a shelter. Besides the knots, how to tie pieces together is another important skill you need in bushcraft camping. Lashing or ropework is important if you don’t want your makeshift roof crashing down on you in the dead of the night. When doing the lean-to design, a square lashing is ideal when you are using trees as support for your shelter. Survivalist or not, we need not elaborate on how fire is essential for survival. Fire provides clean water, food, warmth, and defense from wild animals, and so much more. Yet, keeping a fire protected and going can be the least of all concerns, especially for inexperienced campers. Building a fire can be tough even for survival experts. Keeping it going, especially in the rain is even more challenging. It can be frustrating to see the fire you labored on put out by rain. It is even a smart idea to build a fire shelter first before you start a fire, especially in areas where precipitation is highly likely. You also want to consider these tips: How To Build A Shelter Using Natural Resources! Bushcraft is not simply all about how to survive in the wilderness–it goes far beyond that. It is also, if not more, about creating sustainability and being able to live comfortably within a natural environment, and being able to live your life by being part of our natural world using a more indigenous human approach. Using these skills to live off the land is one of the most satisfying things you can do, both physically and mentally. The connection you get back from nature is hard to compare with anything modern life can offer. These skills take time and effort to learn, but all are learn-able, for everyone, regardless of age. What would you add yourself to this guide for building an overnight bushcraft camp? We will appreciate your tips and suggestions in the comments section below!